Q: What’s the proper way to light a bathroom? A: While the most critical need is adequate lighting at the vanity, I recommend incorporating additional layers of ambient and task lighting in a large space. In a master bathroom, these might consist of a centrally located ceiling fixture, a recessed light over the toilet, and recessed light(s) in the shower. In a powder room, vanity lighting alone might be sufficient (although I always recommend a recessed fixture over a toilet). Every situation and budget is different. 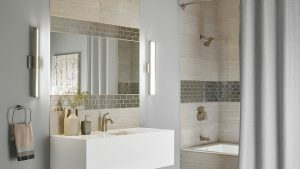 But if you spend $10,000 to tile your walk-in shower, you should allocate $200 more to light it properly! For those on a smaller budget (i.e., most people), installing an exhaust fan with a light over the tub/shower is also a fine solution. Sconces mounted beside the mirror at approximately head height, 65 to 70 inches above the floor, provide the best vanity lighting. These produce even illumination across the face. A sconce or bath bar installed above the mirror provides the next-best lighting. Most lighting designers advise against having recessed fixtures over a vanity as they create shadows under the eyes, nose, and chin, making tasks like shaving and applying makeup more difficult. Opt for sconces with opal versus clear-glass shades, as the latter tends to produce glare. When choosing fixtures, I recommend ones that accept a minimum of 60-watt light bulbs, or the equivalent in an LED, per sconce. 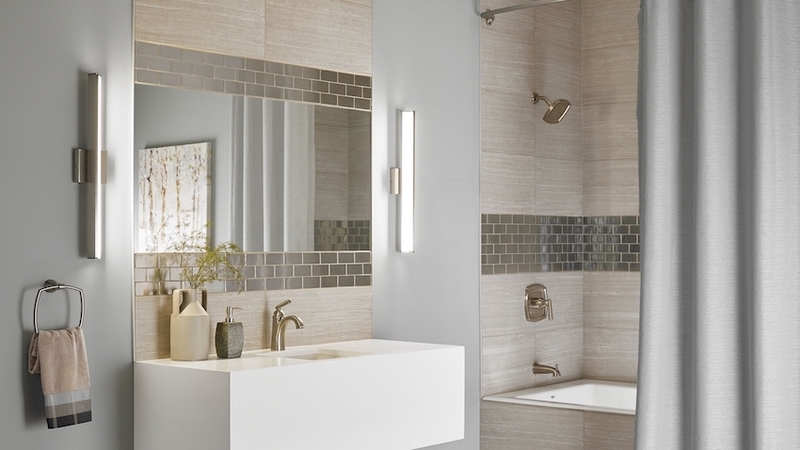 Like all lights, these fixtures should be on a dimmer that you can crank up when you’re getting ready in the morning, and down when you want to relax in the bath.